AGRA Watch welcomes Samuel as part of our effort to support African-initiated programs rooted in agroecological and indigenous farming practices, social equity, and food sovereignty. Samuel is visiting Seattle after receiving the Food Sovereignty Prize – Honorable Mention, awarded at the Community Food Security Coalition’s annual conference in Oakland, CA. AGRA Watch, a campaign of Community Alliance for Global Justice, nominated G-BIACK after visiting them in 2010 to learn more about the Gates Foundation-funded Alliance for a Green Revolution in Africa (AGRA) and indigenous alternatives. 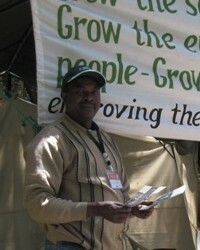 About G-BIACK: Samuel and his wife Peris are the founders of G-BIACK, Grow BioIntensive Agricultural Centre of Kenya. G-BIACK has trained thousands of small-scale farmers in agroecological methods in a region suffering from ongoing drought, high rates of HIV/AIDS, hunger and the effects of chemical-intensive agriculture. G-BIACK hosts a demonstration farm, community library, seed bank and classroom. They work with marginalized communities, including widows, people living with HIV/AIDS, orphans, women and poor farmers. G-BIACK’s programs empower communities to build food systems free from corporate control and rooted in self-determination, local knowledge and ecological sustainability. Learn more about G-BIACK on the web HERE, and watch this 12 minute video, “GROW”. About The Food Sovereignty Prize: The Food Sovereignty Prize has been awarded annually at the Community Food Security Coalition Conference since 2009. The recipients of this prize have contributed significantly to the food sovereignty movement through grassroots action, raising awareness, and/or developing and implementing new programs and policies. Winners recognize the importance of collective action in bringing about social change; they clearly prioritize the leadership of women, indigenous peoples, people of color, migrant workers and other food providers marginalized by the global food system. CAGJ was honored to receive Honorable Mention in 2009. Public Event with Samuel: Come give a warm Seattle welcome to Samuel, and to hear a presentation & see photos about his work with G-BIACK in Kenya. AGRA Watch will give an update on our campaign challenging the Gates Foundation’s role in a “new green revolution” in Africa. Free & open to the public at Southside Commons (3518 S. Edmunds St., Columbia City). Fair Trade for the Holidays items also available for sale! Farmers, gardeners and eaters are invited to join us to share information about agroecological growing practices. *Sue McGann, farmer at Solid Ground’s Giving Garden at Marra Farm, will share methods used at this urban community farm. *David Feinberg, Bee Keeper at Marra Farm will share his experience keeping bees in King County. *Come learn from Sue, David & Samuel, and bring your ideas to enable us to collectively develop a broader understanding of sustainable farming practices!